During growth phase in vivo, tumor tissue xenografted in mouse model systems is vascularized and infiltrated by cells of murine origin. Such contamination makes molecular downstream analysis, like expression profiling or next-generation sequencing, challenging. In addition, culturing human tumor cells is frequently hampered by murine fibroblasts overgrowing target cells. In this application protocol, we describe a time-saving workflow that overcomes these limitations and increases sensitivity of downstream analyses. Xenograft tumor tissue is dissociated into a viable single-cell suspension and untouched human tumor cells are isolated using MACS® technology. PB buffer: Prepare a solution containing phosphate-buffered saline (PBS), pH 7.2, and 0.5% bovine serum albumin (BSA) by diluting MACS BSA Stock Solution (# 130‑091-376) 1:20 with PBS. Keep buffer cold (2−8 °C). Degas buffer before use, as air bubbles could block the column. ▲ Note: Always use freshly prepared buffer. Do not use autoMACS® Running Buffer or MACSQuant® Running Buffer as they contain a small amount of sodium azide that could affect the results. (Optional) Fluorochrome-conjugated antibodies for flow cytometry analysis, e.g., CD326 (EpCAM)-PE. Learn more about our antibodies and dyes. Create a viable single-cell suspension from a solid xenograft tumor using the gentleMACS™ Octo Dissociator with Heaters in combination with the Tumor Dissociation Kit, human. Follow the protocol from the kit data sheet. Human tumor cells are isolated by depleting the mouse cells using the Mouse Cell Depletion Kit and LS Columns. Follow the protocol from the kit data sheet. General workflow for the rapid isolation of human tumor cells from xenograft tumors. The procedure is based on the comprehensive depletion of mouse cells from human tumor xenografts by magnetic cell separation. The procedure is based on the comprehensive depletion of mouse cells from human tumor xenografts by magnetic separation. Flow cytometry analysis of purity of isolated human tumor cells after mouse cell depletion. The original cell fraction (bulk tumor) and the negative cell fraction from the depletion (isolated human tumor cells) were labeled with a pan-mouse antibody cocktail and an antibody against human CD326 (EpCAM) and analyzed by flow cytometry. Over 99% of the contaminating mouse cells were eliminated in less than 20 minutes. Flow cytometry analysis of purity of isolated human tumors cells after mouse cell depletion. Different xenograft tumors were dissociated into single-cell suspensions. Mouse cells were depleted from the suspension using the Mouse Cell Depletion Kit. The original cell fraction (bulk tumor) and the negative cell fraction from the depletion (isolated human tumor cells) were labeled with a pan-mouse antibody cocktail and an antibody against human CD326 (EpCAM). Cultures of isolated tumor cells were nearly pure after seven days. Upon magnetic separation, the original bulk fraction (left) and tumor cell fraction after mouse cell depletion (right) were cultured for three to seven days, fixed, and stained. Cells were stained for the human-specific epithelial tumor marker CD326 (EpCAM) and vimentin (human tumor cells were negative for vimentin) to unambiguously identify fibroblasts. Even after seven days, the cultures of isolated tumor cells were nearly pure. Positive influence of non-tumor cell depletion on the quality of next-generation sequencing data. DNA from bulk tumor or isolated tumor cells of three different xenograft models derived from human kidney, lung, and bladder cancer were used to produce exome-captured sequencing libraries applying the Nextera® Rapid Capture Exome Kit (Illumina®). For sequencing on a MiSeq® instrument (Illumina), the MiSeq Reagent Kit v3 (150 cycles, Illumina) was utilized to generate 75-bp paired-end reads. As the capture oligonucleotides used for targeted enrichment of protein-coding sequences were designed based on the human genome, an initial pre-enrichment of DNA fragments of human origin from the mixture of mouse and human cells was expected. To assess the number of capture oligonucleotides that might cross-hybridize with mouse genomic DNA, BLAST searches of each single Nextera probe against mouse genome were conducted and the resulting alignment parameters were used to determine possible cross-hybridization. Depending on the selection thresholds (alignment length, no. of mismatches, no. of gaps), a cross-reactivity of 5–10% of capture probes with mouse transcripts was predicted (data not shown). (A) A significant increase (p < 0.05) in cluster density (not shown) as well as an average increase in read counts of 33% was observed for the samples depleted of mouse cells, indicating improved sample quality. A corresponding strong reduction of debris and dead cells upon mouse cell depletion was also apparent in flow cytometry analysis (data not shown). (B) After adapter clipping (trimmomatic v0.32), reads of all samples were mapped against human and mouse genomes (bwa v0.7.12) and putative origin was determined based on the respective alignment parameters (LINUX shell, command-line Perl). (C) Detailed read assignment for bulk tumor and isolated human tumor cells derived from the bladder cancer xenograft. 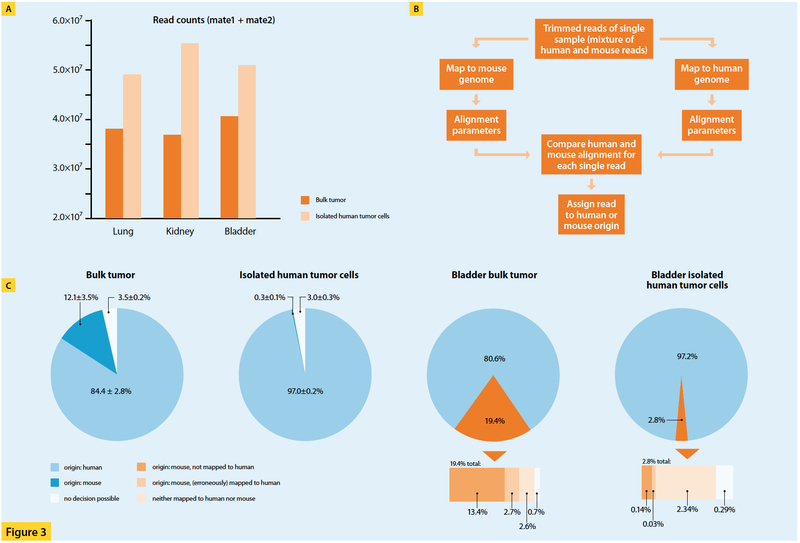 An average of 12% of reads derived from bulk tumor samples was attributed to mouse cells. This amount could be reduced to 0.3% by prior depletion of mouse cells. On average, 15% of the mouse-derived reads mapped erroneously to the human genome (1.9% of total reads) in the bulk tumor samples, demonstrating a strong positive influence of mouse cell depletion (0.04% of total reads erroneously mapped to human genome) on downstream analyses. Positive influence of non-tumor cell depletion on the quality of next-generation sequencing data. DNA from bulk tumor or isolated tumor cells of three different xenograft models derived from human kidney, lung, and bladder cancer were used to produce exome-captured sequencing libraries applying the Nextera Rapid Capture Exome Kit (Illumina). For sequencing on a MiSeq instrument (Illumina), the MiSeq Reagent Kit v3 (150 cycles, Illumina) was utilized to generate 75-bp paired-end reads. As the capture oligonucleotides used for targeted enrichment of protein-coding sequences were designed based on the human genome, an initial pre-enrichment of DNA fragments of human origin from the mixture of mouse and human cells was expected. To assess the number of capture oligonucleotides that might cross-hybridize with mouse genomic DNA, BLAST searches of each single Nextera probe against mouse genome were conducted and the resulting alignment parameters were used to determine possible cross-hybridization. Depending on the selection thresholds (alignment length, no. of mismatches, no. of gaps), a cross-reactivity of 5–10% of capture probes with mouse transcripts was predicted (data not shown). (A) A significant increase (p < 0.05) in cluster density (not shown) as well as an average increase in read counts of 33% was observed for the samples depleted of mouse cells, indicating improved sample quality. A corresponding strong reduction of debris and dead cells upon mouse cell depletion was also apparent in flow cytometry analysis (data not shown). (B) After adapter clipping (trimmomatic v0.322), reads of all samples were mapped against human and mouse genomes (bwa v0.7.123) and putative origin was determined based on the respective alignment parameters (LINUX shell, command-line Perl). (C) Detailed read assignment for bulk tumor and isolated human tumor cells derived from the bladder cancer xenograft. An average of 12% of reads derived from bulk tumor samples was attributed to mouse cells. This amount could be reduced to 0.3% by prior depletion of mouse cells. On average, 15% of the mouse-derived reads mapped erroneously to the human genome (1.9% of total reads) in the bulk tumor samples, demonstrating a strong positive influence of mouse cell depletion (0.04% of total reads erroneously mapped to human genome) on downstream analyses. Agorku, D. et al. (2016) Novel methods for the isolation of tumor cells from human, mouse, and xenografted tumors. 2016 AACR Conference; Manchester, UK. Agorku, D. et al. (2015) Next-generation sequencing of human tumor xenografts is significantly improved by prior depletion of mouse cells. 2015 AACR Conference; Philadelphia, USA. Application Note: Mouse cell depletion from patient-derived xenograft brain tumors and isolation of glial cancer stem cells. Jeremy Rich Lab, Cleveland Clinic, USA. Application Note: Depletion of mouse cells from dissociated patient derived xenograft tumors using the gentleMACS™ Octo Dissociator with Heaters, followed by magnetic cell separation. Massimo Moro Lab, Milano, Italy. REAfinity Antibodies Brochure: More specific. More impact.